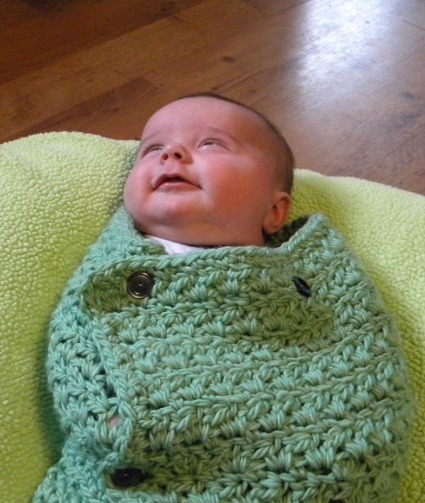 This baby cocoon has an attached, hinged rectangle that can be cinched tight to swaddle your wee one. 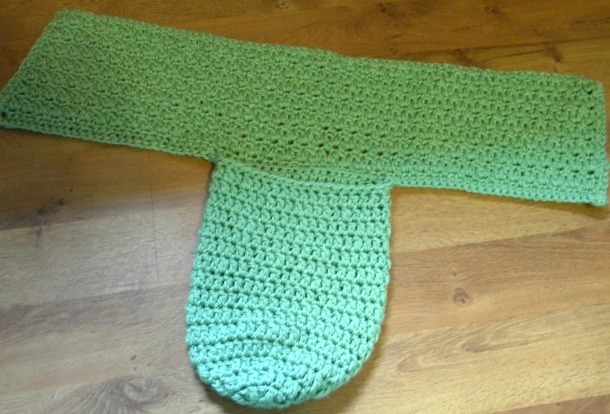 The rectangle can be folded down for the smallest of newborns and the chunky yarn has nylon that gives it a nice stretch as your baby grows. I have found that swaddling my son, especially before bedtime, helps him fall asleep faster and stay asleep longer which means, of course, more sleep for mommy! Linked Double Crochet (ldc) : Insert hook into lower horizontal bar of stitch just made, yo, pull up loop, insert hook into next stitch, yo, pull up loop (3 loops on hook), yo, draw through two loops on hook, yo, draw through remaining two loops. Half Double Crochet Decrease (hdcdec): Yo, insert hook into same stitch, yo, pull up lp, yo, pull through two loops on hook, yo, sk st, insert in next ch sp, yo, pull up lp, (4 lps on hook), yo, pull through all 4 loops on hook. Note: This project is worked in the round for 16 rounds and then back and fourth. Rnd 16: Dc in next 38 stitches, hdc in next st, sc in next st, sl st in next st.
At this point, begin working back and forth. Row 1: Chain 30, turn. Row 2: Sc in each chain, sc in BLO in 20 stitches of the cocoon, 30 fsc, chain 1, turn. Row 3: Sc in first fsc. *Ch 1, sk st, sc in next st.* Repeat from * to * across; chain 2, turn. Row 4: Hdc in first ch-sp, ch 1, *hdcdec, ch 1. * Repeat from * to * across; hdc in final stitch, ch 1, turn. Row 5-16: Repeat Rows 3 and 4. Row 17: Sc in each st to penultimate st, 3 sc in last st, turn 90 degrees, sc along edge, make 3 sc in corner to turn. Sc along bottom edge, sc2tog join st and first st of cocoon, sc along top edge of cocoon. Sc2tog last st of cocoon and join st, sc along bottom edge, make 3 sc in corner to turn, sc along edge, make 2 sc in final st, sl st to first st of row, fasten off. Finishing: Weave in ends, sew buttons as seen in photo. Wrap up baby tight and smother with kisses. Optional: I used a stitch in the rectangle wrap part that was open enough to pass a button through, but not so open as to not keep a wee bairn warm. Feel free to experiment with other stitches in this section to make yours unique! 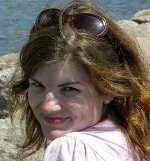 Kara Cardella (karafay on Ravelry) tends to look at items and think, “I wonder how I can do that in crochet.” She’s a new stay-at-home mom and can’t get enough snuggles with her son Cale. Her husband wishes her crochet accouterments took up less of the couch. Pattern & images © Kara Cardella. All rights reserved. This is just beautiful thank u for sharing ur work! Great job, love it- maybe I will be gifted with one more child so I can try it out. This is adorable! 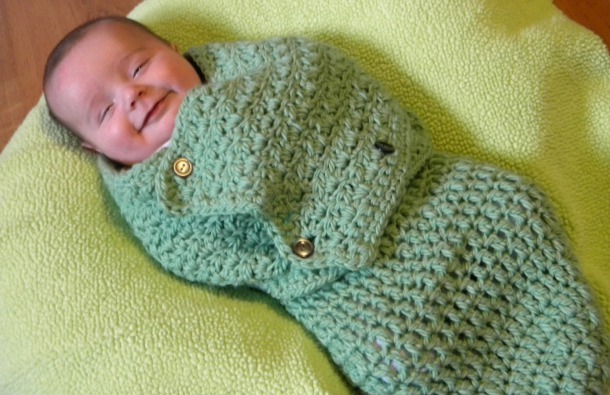 I *just* bought a bunch of this Beehive yarn, and have been searching for the perfect cozy baby project. Thanks!